Paver Traders can help complete your commercial construction or remodel project. Pavers can add a unique and stylish accent to your commercial property. Anywhere from a stunning paver parking surface or a paver restaurant dining patio. Turf Block permeable pavers offer a flexible application. Use them for parking surfaces, driveways or patios. 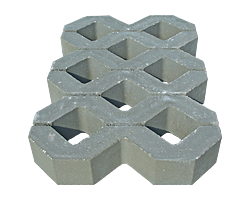 Manufactured 3-⅛" thick, Turf Block provides a sturdy pavement for vehicular traffic that is perfect for both residential and commercial uses.